Earth Day's 45th anniversary is almost here. Wednesday, April 22 is the day when people around the world come together to talk about Mother Earth. This year, the Earth Day Network is urging global leaders, businesses and citizens to commit to do their part to bring more awareness of the link between economic growth and sustainability. They are calling out to the leaders of the world to support massive climate change policies and make larger investments in renewable, less impactful energy solutions. You may have read about Sudan, the last known male northern white rhino left in the entire world who is under armed guard protection in Kenya. These animals, targeted by poachers, are on the verge of extinction because their horns are becoming more valuable than drugs in some Asian countries. Contributing to their decline is the continuing loss of their natural habitats due, in part, to the needs of our ever expanding human population. But not all is lost. Programs like the North Luangwa Conservation Programme (NLCP) are focusing their efforts to bring back rhinos from the edge of extinction. With preserves in the Luangwa Valley of Zambia, their conservation efforts are thriving with the reality of having 70-80 rhinos within reach in the next few years. The NLCP also spends time combating poaching, with a team of 250 anti-poaching officers who patrol regularly every month. There are many ways to help the cause. 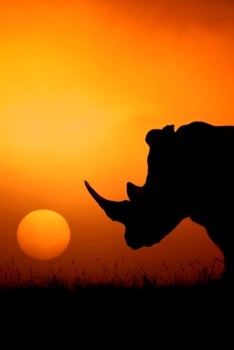 You can donate to savetherhino.org, volunteer to help at local Save the Rhino's event, and in some areas, you can even be a Rhino Keeper for the Day and get up close and personal with these amazing animals.